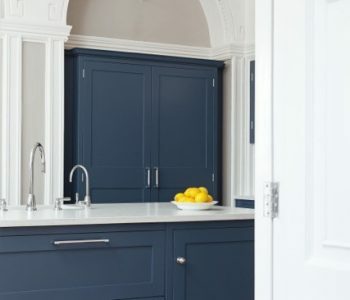 How to Create a Sussex Style Kitchen. Home improvements. 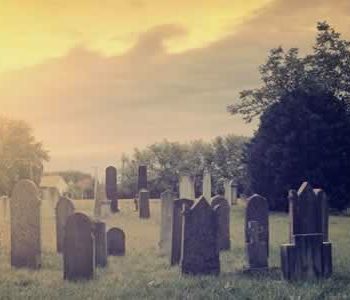 Sussex is a huge and historic county – some might say it’s the best – boasting the wonderful Downs, the Regency splendour of Brighton and Hove, and the majesty of Bodiam Castle, to name but a few highlights. Then there’s the ancient legends of giants at Arundel, the site of the Battle of Hastings and the notorious Beachy Head. The subject of many novels; the setting for many films, Sussex also offers a good quality of life. It’s a distinct county, with an identity that’s encapsulated in its unofficial motto: ‘We wunt be druv’, which effectively means inhabitants won’t be told what to do and have a mind of their own – and that certainly applies as far as architecture goes. Though home to some of the UK’s most elaborate buildings, such as the Indian-inspired Brighton Pavilion, the style of buildings in Sussex are actually typically fairly conservative (beach huts exempt, of course). With more space at their disposal, the semi-detached is more common than the terrace, and with farmland in plentiful supply, you’ll see many barn conversions. Many of the county’s buildings are built using materials which exist in the land nearby. The South Downs area is well known for its association with flint; buildings are clad in the grey swirled stone, providing a unique appearance that you don’t see elsewhere. The Weald is more renowned for sandstone. Otherwise, brick prevails, made sometimes using the clay that extends across the Weald. Whether you live in Sussex, used to live in Sussex or simply love the county and want to inject a little ‘south’ into your home, there are lots of ways to reflect it in your kitchen. 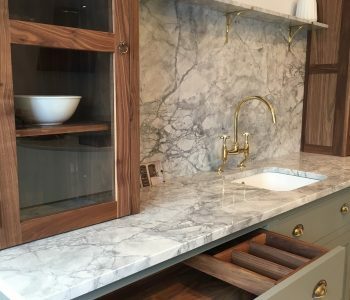 Your choice of worktop is one of the biggest statements you can make – this is something that you’re not likely to change in a hurry. 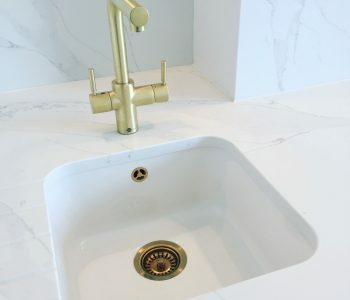 While there are all sorts of colours and patterns available, to reflect your love of Sussex, you might like to opt for quartz – after all, flint is a type of quartz. Forest Snow, Imperial Grey and Quasar are a few options that all resemble flint. Alternatively, Teton Beige, Jerusalem Stone and Cream Soave all resemble the Wealden Sandstone. If you wanted a granite kitchen worktop, there are equally as many colours to choose from which evoke the effect of those Sussex stones or local brick. Warm, friendly, country-themed and perfect for entertaining – that’s the Sussex kitchen. To create that atmosphere, minimalist probably isn’t the way to go, but you don’t need to go crazy and cover every wall with family photos and knick-knacks. We’re talking about a neutral, light – maybe even sandstone yellow – paint on the walls for that ‘Sussex morning’ effect. Bring in an upcycled dresser with pretty plates or cups and saucers, for that real farmhouse feel. Ultimately, using the kitchen as it was intended – bringing people together to nurture and sustain – is how to create the right atmosphere. A kitchen should be used, enjoyed and loved. Just wipe up any spills on the worktop! The colours we’ve proposed – or rather, Sussex, has – are probably the most perfect shades for kitchen flooring. 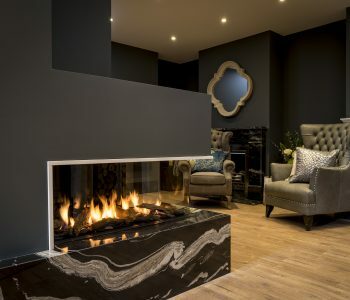 Grey granite (flint-like) slabs, sandstone and red terracotta look great but also provide an enduring, hard-wearing covering; enough to weather the endless storm of traffic coming through the room over the decades. A search online will reveal the accessories ideal for bringing a taste of Sussex into your kitchen with ease. Accessories such as a flint-coloured stove kettle, butter dishes and cups are practical as well as attractive. Your tea towels, napkins, window blinds and fruit bowl could match the theme, and plants could be displayed in stone vases. Perhaps you could even obtain a slab of your chosen material to use as a chopping board, splashback or even place mats. Failing that, you could take a look through Sussex Style magazine’s Home and Interiors section for some inspiration. How about some beach huts here and there? Creating a Sussex style in your kitchen shouldn’t be too difficult, especially given the boundless natural beauty that the county possesses. Just taking a walk outside could be enough to inspire you to bring a taste of the south into your home. If you’d like to talk through your ideas, please get in touch on 01243 544770 or contact us via our website.